Ok, where have I been? How is it that I had never heard of Lamingtons? What’s that you say? You’ve never heard of them either? They look like the fun cousin of petit fours (which have always been a bit prissy for me). Coconut, Chocolate, Cake, with yummy fillings…I want one now! Well, here’s an excellent blog, The Bubbly Baker, that explains it all! Posted in baking, coconut, Milk chocolate, references, recipes. Bookmark the permalink. Love the site. 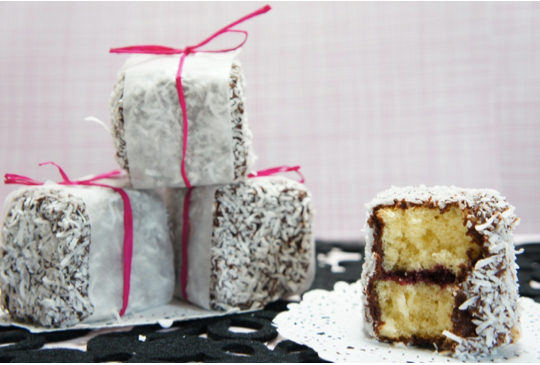 Did you know that Lamingtons are thought to be named after Charles Cochrane-Baillie, 2nd Baron Lamington who serevd as Governor of Queensland from 1896 to 1901, or after his wife Lady Lamington. Tradition has it that they were invented when unexpected guests arrived for afternoon tea at Government house and something had to be done to resurrect a stale sponge cake. This most unlikely of offerings was a great hit and the recipe passed on.